Whoo hoo. The time has arrived. It's time for a brand new mythical, mystical dragon to show up this Halloween. And all you gotta do to conjure it up is to find a kid to do the summoning. Of course, they will also have to slip into this Chompin' Red Dragon Costume, but we don't think they'll mind. Because they're going to be chomping around for some big treats! 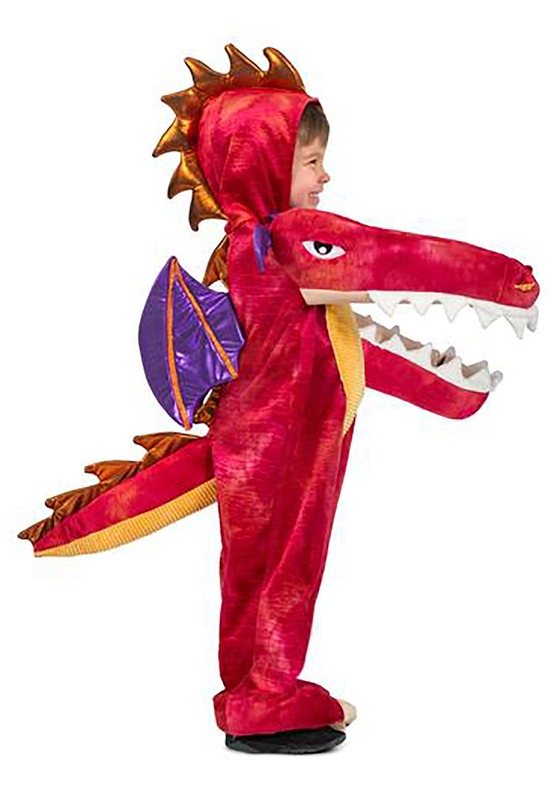 This Child Chompin' Red Dragon Costume is styled as a jumpsuit with dragon details. With one very important twist. Each arm is a part of the dragon's jaws. With this fun and unique style, when your kiddo swings his arms around, that's gonna mean that the dragon is ready to eat! He'll be ready to chomp chomp chomp when he suits up in this fun suit. Styled as a one-piece jumpsuit, it secures with a hook and loop fastener strip. The costume has lots of details that make it stand out. The dragon eyes and a snout are featured on the right arm along with soft teeth on both arms. It also has a plush tail, soft-sculpted orange spikes, and attached purple dragon wings. 100% polyester, all you'll have to do to turn him into the hungry dragon is to flip the hood up and instruct him on how to swing his tail. And on how to do the mouth effect with his arms! Of course they'll have a big ol' pair of jaws in this costume, because that's what the Chompin' Red Dragon is all about! We do think this costume is the recipe for costume fun, no matter what activities are in mind. For Halloween trick-or-treatin' or just for costume playtime, this dragon costume is guaranteed to be a ton of fun!